SEATTLE- The Cleveland Browns struck first, with Johnny Manziel racking up consecutive first downs and finding his tight end, Gary Barnidge for a touchdown. Cleveland would have to settle for a pair of Field Goals after that, losing to the Seattle Seahawks 13-30 on the road. The Seahawks lost a challenge early in the first quarter that led to Cleveland’s first score, but the got some love from the football gods on a pass interference call on Cleveland’s coverage of Jermaine Kearse in the end zone. On a goal line stand, Wilson floated his next pass to Doug Baldwin for his first of two touchdowns in this game. Tyler Lockett racked up 55 receiving yards and a score, a 27 yard pass from Wilson into the end zone. The target leader for the wide receivers in this game was Jermaine Kearse, who converted 7 of his 8 targets to the tune of a cool 110 yards. Another big story line was the four headed running back by committee beast, as fullback Derrick Coleman split carries with newly signed backs Bryce Brown and Christine Michael, along with third down specialist Fred Jackson. This committee successfully accumulated 184 rushing yards on the ground, with 84 of those yards coming from Christine Michael alone. The ability to keep the running game going at this level speaks even more volume to the efforts of the offensive line, as Brown hadn’t played football in a long time, and Michael came from the Washington Redskin’s practice squad. The ‘Hawks offense converted 9 of 12 third down conversions, and never seemed to let their foot off of the throttle. Kelcie McCray started in place of the injured Kam Chancellor, and led the team in tackles with 8. 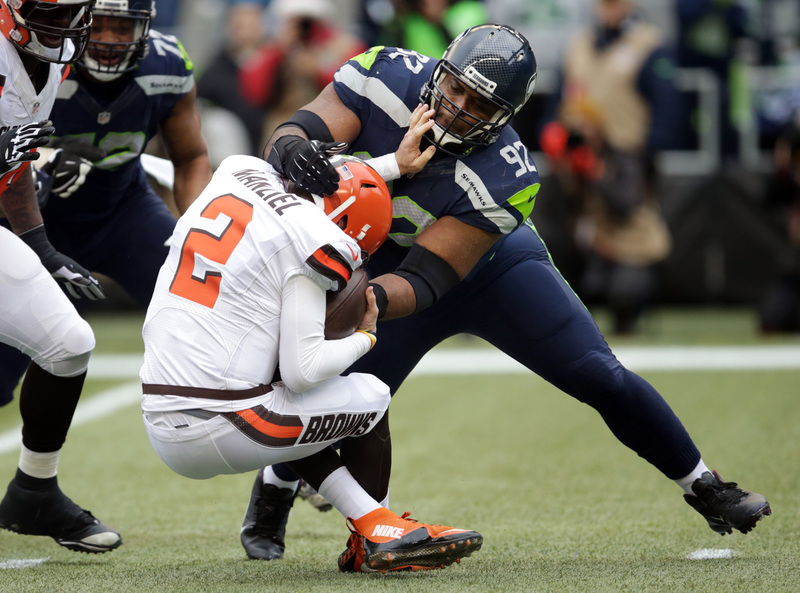 Brandon Mebane, Michael Bennett, and Marcus Burley notched a sack apiece in this game, with Burley also intercepting Johnny Manziel. The defense once again allowed less than 100 yards on the ground, and only 136 yards through the air. After the first touchdown was scored by the Browns, the defense came alive and held them to a pair of field goals (one in the second quarter and one in the fourth quarter) while racking up 50 total tackles as a team. Up next for the ‘Hawks is the St. Louis Rams, whom they lost 34-31 in overtime Week 1 of the 2015 season. Todd Gurley, the stud running back for St. Louis, was not healthy in that game, but will start this week. The ‘Hawks defense has been able to contain even bigger names to less than 100 rushing yards and no scores, even to league leaders Matt Forte and Adrian Peterson, and the passing game in St. Louis (chaired by Case Keenum, not Nick Foles) has improved a bit, which will make this game highly interesting. The Rams were shellacked on total yardage, 1st downs, against their last opponent, the Tampa Bay Buccaneers. The Rams were much more efficient, scoring through the air when the ground option through Gurley wasn’t working. Even with injuries piling up for St. Louis, they focus a lot on rushing the quarterback and will look to equal of better their six sack record against Seattle in Week 1.The Rams are known this season for slowing or ceasing opposing teams 3rd down conversions, and for their trick plays, so it wouldn’t be surprising to see some of those displayed here. Seattle still needs to win every game possible, even though they’ve clinched a playoff spot. There are a few teams still within striking distance, so the #5 seed isn’t a lock yet.